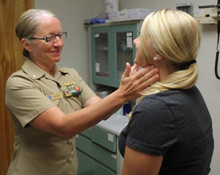 The clinics and services available at military treatment facilities vary by location. Before you move, identify the military treatment facility that will serve you, visit its website to learn about the services available and get contact information. If you anticipate a move to another TRICARE region, work with your local TRICARE service center or case manager before your move to ensure the transition is as smooth as possible.